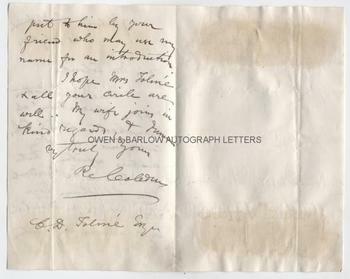 RICHARD COBDEN Autograph letter Signed. British (English) radical politician, reformer and manufacturer. ALS. 2pp plus integral blank leaf. 27 Victoria Street, Westminster. 21st July 1864. To Mr C.D. Tolme. 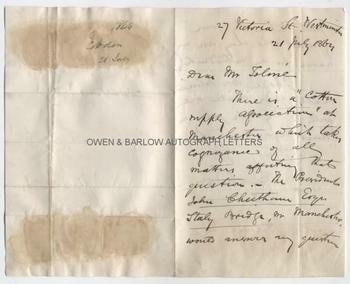 "There is a 'Cotton Supply Association' at Manchester which takes cognizance of all matters affecting that question. The President, John Cheetham Esquire, Staly Bridge, nr Manchester, would answer any question put to him by your friend who may use my name for an introduction. I hope Mrs Tolme and all your circle are well. 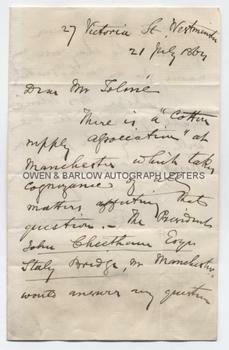 My wife joins in kind regards, I remain very truly yours" [etc]. 8vo. Approx 7 x 4.5 inches. Docketed on verso of integral blank leaf. Old folds. Mounting traces to verso of integral blank leaf and some browning from old paste. All else near fine. Richard Cobden was one of the most important of the 19th century Liberal radicals. With John Bright he established the Anti-Corn Law League. The successful repeal of the Corn Laws was the principle reason for the downfall of Sir Robert Peel and his government. Richard Cobden was a ceaseless campaigner for free trade, peace and social reform - issues which he championed with high moral rectitude. Cobden was of huge influence on the British government's stance on the American Civil War. He has been called "the greatest classical Liberal thinker on international affairs" and was undoubtedly one of the great political free-thinkers of his generation.